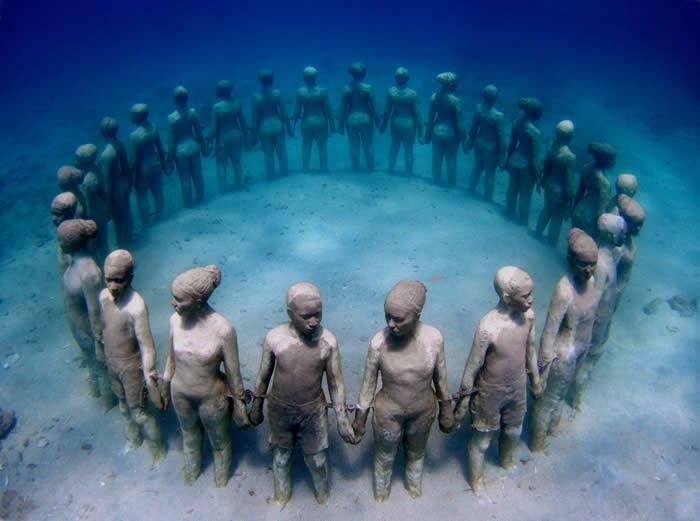 We posted images of the underwater sculptures in Grenada by Jason de Caires Taylor. The pictures of the beautiful scenes of what was originally thought to be a tribute to fallen African slaves have been circulated on many websites. A few weeks ago I noticed that there were comments circulating that this indeed was not true and that the sculptures had nothing to do with slavery. Although I do find it interesting that these particular sculptures were allowed to be placed on the island of Grenada I also have to respect the artists intention and commend the fact that now that he’s aware of what many take the sculptures to mean that he is now leaving the intention open to discussion.